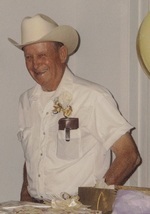 James “Buddy” Clements, 91 of Umatilla, FL, passed away on Saturday, February 2, 2019. He was born on April 7, 1927 in Lumber City, GA. He worked for A. Duda & Son in agriculture and was in the United States Army and a veteran of World War II. He is survived by his Son: James Clements; Daughters: Debra Kemp and Cheryl Horn; sisters: Lois Bohannon; Grandsons: Jeff Clements and Bryan Kemp; Great-grandchild: Hadley Kemp. He was preceded in death by his wife: Marion Clements; Brother: Alexander Clements, Jr and Sister Louise Brown. The funeral will be held at Beyers Funeral Home Chapel in Umatilla on Wednesday February 6, 2019 at 11:00 a.m. with Pastor Brooks Braswell officiating. The family will receive friends from 6:00 p.m. - 8:00 p.m. on Tuesday, February 5, 2019 at the funeral home. The interment will follow the funeral at the Lakeside Memory Gardens in Eustis, FL. Online condolences may be made at www.beyersfuneralhome.com. Arrangements entrusted to Beyers Funeral Home and Crematory, Umatilla. To send flowers to the family of James "Buddy" Clements, please visit our Heartfelt Sympathies Store.